iGEM—an opportunity for team members to experience the entire cycle of research from conceptualisation, through fund-raising, implementation and peer reviewing of the results. The genetic principle is arguably unique to biology in the natural sciences. As a result, the closest analogy in terms of general principles of biological function often borrows from engineering. In this view, biological systems have a memory module, implemented in nucleic acid chemistry. The information stored in this (usually DNA based) memory is both in terms of how to make more of the memory module (replication) and how to build and maintain the machinery (transcription, translation). At a higher level of integration, the machinery has information encoded in it, which allows it to interact with other components. This forms many complex, inter-related `devices’ that can sense, respond and perform specific functions (all of cellular physiology). Seen from this perspective, cells are comparable to a complex machine which functions as an adaptive, self-repairing and self-replicating robot. It is not coincidence that despite the sophistication that engineering has achieved, it has still not come close to achieving the ability to manufacture devices from the molecule upwards, and with this degree of functionality. This, at the base, is the premise of the International Genetically Engineered Machines (iGEM) competition. Begun as an unstructured learning class—the independent activity period (IAP) at the Massachusetts Institute of Technology (MIT) in Boston, USA—it has grown in proportion to be the most popular (but not the only) synthetic biology contest directed at undergraduates. With its emphasis on real-world problem solving using synthetic biology with a combination of experiments and theory, it has also resulted in some of the results being spun off into start-up companies. In 2015 alone, 280 teams from around the world participated in the contest. What is iGEM and how does it work? The contest is framed in the mode of a team project involving group-work. Each group needs to be supervised by a principal investigator (PI). Typically groups consist of between 5-15 undergraduates, 1-3 PhD student or postdoctoral supervisors and 1-3 PIs with a record of scientific peer-reviewed publications. A lab to host and facilitate the group can simply be space made in one of the PIs labs or space permitting, even a specialized undergrad lab can be put at the disposal of the team. The PI is typically an independent researcher or professor at some stage. The job of the supervisor is to guarantee the authenticity of the work, its ethical conformity and scientific quality. This is over and above the more practical needs of being able to provide for resources of a standard molecular biology lab—cell culture facilities for bacterial or other organisms such as incubator and laminar air hood, cold storage, and standard molecular biology lab equipment such as PCR machines, centrifuges, glass- and plastic-ware, reagents and standard biochemical reagents. Typically, supervision by more than one PI can help to both engender diversity of thought and spread the supervisory workload. Additionally, PIs typically bring the competence of their trained postdoctoral scholars or PhD students to bear in assisting with the day-to-day supervision of the team. This is in particular essential when team members are inexperienced in working in a research lab, especially with gene cloning and expression. Lest I however leave you with the impression of a `top-down’ approach, many alternative models exist. For instance, students with a concrete idea and a team could just as well approach a PI and propose a concrete project, or the entire exercise could even be conducted as a course within the structure of a college or university. 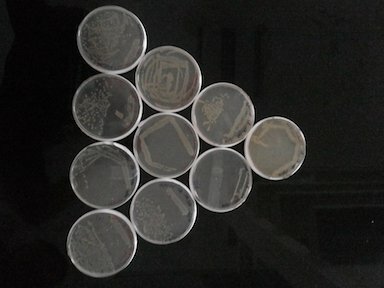 The process of fund-raising for additional reagents and resources depends on the creativity of the PI and sometimes even the team members as seen with the recent efforts at crowd sourcing by an iGEM team. This mode of relying on public charity is however more likely to occur when the work is conducted in a DIY environment. The dangers of genetic engineering without proper management of the inputs and waste products can, however, be a serious issue, yet to be clearly addressed by the community. 2015 saw another first—a presentation by the Federal Bureau of Investigation (FBI), USA on the safety aspects of synthetic biology. The reason for this equivalent of the Central Bureau of Investigation (CBI) in India to address an international audience stems from multiple fears in the recent past of directed pathogen development by ‘freelance’ researchers, ending up in the wrong hands. So as the Linux dictum (borrowed from Spiderman) goes “With great power comes great responsibility”, the project does demand a sense of responsible working. What was our experience participating in iGEM 2015? As the team leader and supervisor, it was a hectic summer, which culminated in many last-minute experimental trouble-shooting sessions. Guest lectures from investigators working in aspects of molecular microbiology and genetic engineering for therapeutics helped in the initial stages of project preparation. An intense two months of brainstorming allowed the team to narrow down a feasible, interesting and relevant problem to solve- in our case relating to tuberculosis diagnostics. In the end, the intensity of the effort and the enthusiasm of the team members, and their willingness to put in that extra bit, brought both some interesting results to light and allowed all of us to see the benefits of time-bound target driven undergraduate research. The results were also posted on social media platforms (e.g. : Facebook and Twitter) and have a permanent web presence. Additionally, our team participated as a warm-up exercise, in the reproducibility study- the InterLab measurement. Fund-raising is an aspect that requires a section of its own. In our experience, companies that manufacture specialty biochemicals and instruments (Merck and Eppendorf) were generous in supporting our team, when approached. Additionally many companies such as MATLAB and IDT provide sponsorship in kind— software and DNA sequences respectively. However, students approaching potential donors did not achieve the desired results, mostly due to their need to see an official tone to the project, and the (understandable) need to hold somebody accountable. The Department of Biotechnology, Government of India, based on a grant proposal by this author, provided timely and generous support, without which much of the project would never have been completed. The lesson there was that fund-raising is not a linear process. A flexible approach to budgets, approaching potential sponsors and a lot of adjusting of budget and expectations is advised. Asking for funding for a high-risk project (with low probability of success) for a short period of time and conducted with students who are in training can be a difficult case to make. So what are the potential benefits to the donors? The obvious attraction is exposure at the biggest international platform in synthetic biology. Additionally, the visible support for local training of research students is part of the corporate social responsibility (CSR) of many corporations. The bonus can come from actual success in possibly developing and prototyping technology, which could be applied to solve a real world problem. The delays in shipment due to miscommunication about customs paperwork did cost us two weeks, but these were only one-time hiccups in an otherwise smooth shipment process from both ends—to us from iGEM foundation and from us to submit the final BioBricks to Boston. Certainly receiving the package of multiple DNA parts from iGEM to begin our project was the most exciting start-point, converting the abstract emails and fund transfers into tangible DNA sequences, which could be made to do something! And finally contributing parts at the end of the contest left most of us with a deep sense of fulfilment, at having become a part of a global effort. As a prelude to the Giant Jamboree in Boston, the team presented its results at the Asia Meetup organized by NCTU based in Taiwan, through a real-time web-presentation. We also hosted the first India Meetup in IISER Pune. Both these provided valuable opportunities to take stock and prepare the team in the run-up to the finale in Boston. The Jamboree itself is divided into many parallel sessions and selection was in a tournament style for the final round. It goes without saying that successful participation in iGEM demands hard work, logistics, planning, creative thinking, web designing, project management and team-work. These and the sheer joy of doing exciting science, make iGEM an attractive project option. For those fortunate enough to be selected to travel to Boston, USA, this is a remarkable opportunity—everybody from Google down to small startup firms and labs are present in strength. Matching wits with the best of the world is a bonus. Working within submission deadlines, familiar to most students, ensures that unlike many research projects, time to achieve work targets is finite. At the same time, it offers an opportunity for participants to expand their own skill base and work within the framework of international standards—a fabulous hands-on training opportunity for every participant. Through groups on Facebook, initiatives to look at projects from a novel angle and other surveys, technical and other help is always at hand from iGEM teams. In that sense, the competition is less of a simple us vs. them exercise, but more global community effort. More recently (2015 onwards), as a result of a tie-up between iGEM and the journal PLOSONE, all work presented at the iGEM contest can also be submitted to PLOSONE either as a part of PLOS Collections Blog, or if the results are sufficiently novel even as a Research Article to the journal PLOSONE. While the regular criteria for submission and stringent anonymous peer review will be followed for Research Reports submitted to PLOSONE, for the PLOS Collections Blog, the reports will be reviewed through an open review process. The latter is a novel attempt at an alternative to the single blind anonymous peer-review process. Thus, iGEM provides an opportunity for team members to experience the entire cycle of research from conceptualisation, through fund-raising, implementation and peer reviewing of the results. Additionally, by facilitating DNA submission of completed `parts’, it contributes to the effort at Open Source synthetic biology. The contribution to posterity is an added bonus.